This work is part of a set of paintings on Masonite, all of the same size and executed with the same technique, made in Montroig in the summer of 1936. Mirò explored a wide range of different mediums: oil, tar, casein and sand, allowing these to share the limelight with the painting itself. At the end of the 1920's the artist had already taken a crucial turn in his work, setting himself free with regard to representation and use of mediums in the collages belonging to the period he himself called "Antipainting". During the following years he continued to explore rich mediums, textures and objects which would make an impact on the viewer. In these works on Masonite, he left the support bare, thus obtaining a chromatic foundation and a rough and textured surface. On it he drew with continuous black lines the shapes which he then partly covered with colour. Some of the forms are repeated in other paintings from this same set, like the rainbow made with concentric semicircles, the x-shaped figure or the pendulum. 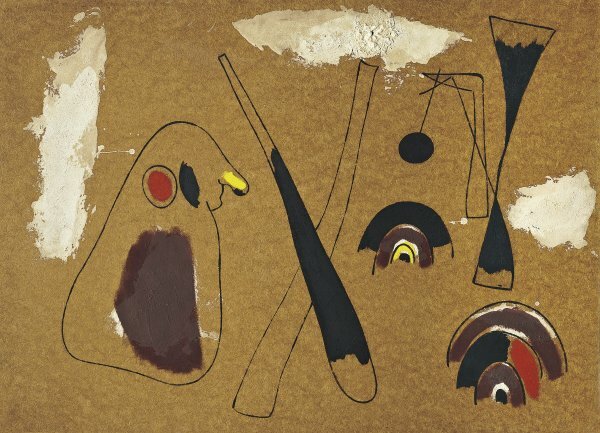 In one of the preparatory sketches for the series, Mirò wrote down his initial intention: to consider these paintings on Masonite like cinematographic sequences, indicating the predominant colour in each of them, as well as some of its elements: man, woman, rainbow, wire, etc. He intended to project them all on a large canvas, and even to make some objects with wire and hang them before the paintings. In this connection, it is important to recall Calder's presence in Montroig in 1932, where he presented his wire circus. Mirò himself established the origin of these paintings in the project for the ballet Jeux d'Enfants which Massine commissioned him in 1931, and for which he made, between that year and the following, a series of drawings for the costumes and set, in which the dancers and mobile accessories seemed live signs gravitating on the surface. Although he never managed to put into practice these ideas, with the sequential disposition of these paintings Mirò intended to break away from the idea of the isolated work. The period in which he painted this work was marked by the tragedy of the Civil War, but the poignant feeling which permeates his piece was already present in the previous years. Anguish can be perceived in some highly aggressive paintings, not just in the deformation of the characters, but also in the bitter and intense colours. To this respect we can mention the pastels representing monstrous figures executed in 1934, as well as Man and Woman in front of a Pile of Excrements of 1935. In this painting belonging to the Carmen Thyssen-Bornemisza Collection, that chromatic treatment has disappeared, and the colour is conceived more like as patches and accents than as a dominant totalising element. Here, the chromatic restriction favours the range of blacks, browns and whites, with some patches of brighter colours. A few months earlier, he had made an even greater reduction in a series on sandpaper entitled Signs and Simbols, limited to black, and in which the element of the sign itself was very strong. Mirò was deeply attracted by certain shapes and objects which, when they related to each other in the painting, created "poetic shocks". In the painting analysed here, the outlined elements floating in space and activating each other have their origin in a practice begun in the 1920s. The calligraphic component is one of Mirò's most characteristic traits, but the dynamic and magic-like feeling of his previous works acquires here a grave and dramatic character. These are expressive works which reveal the artist's distress due to the war which that autumn led him and his family move to Paris, where he remained until 1940.